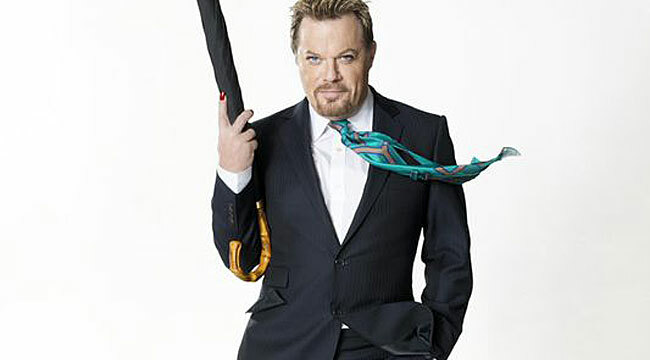 There might not be a comic currently working the circuit who has more international appeal than Eddie Izzard. He’s endeared himself to the locals by learning to perform in French and German and now he’s prepping to do the show in Spanish, Russian and Arabic too. Dubbed Force Majeure, the history-obsessed Brit’s current show includes lots of good jokes, including a funny segment on he just doesn’t get musicals. 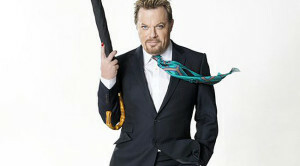 Izzard phoned us from a Boston tour stop, where his U.S. tour had just started. “In the world tour terms, we’re now up to 24 countries,” he said. You’re performing 51 shows in 32 cities in 63 days. What inspired you to take on such an insane tour schedule? I haven’t done the mathematics, but I’m sure that is correct. I want to play all 50 states. If you’re doing anything creative, you’re trying to create a bit of noise and excitement. That’s why I do gigs in multiple languages and run the marathons. It all adds to making it a circus coming to town. I’m always trying to move forward and go to different places. You’ve taken Force Majeure around the world. You’ll have performed in 25 countries on five continents when the tour is finally done. What about the show translates to such different audiences? The trick that I’ve done is to make all the comedy universal. All you have to do is drop your national references. You can use them but you have to explain them. If I’m talking about human sacrifice and medieval kings and dinosaurs and Darth Vader and God arguing, people in New York get this and in Moscow they get it. In Auckland, New Zealand and Istanbul, Turkey they get it. You just use universal themes or ideas and it will work all around the world. What initially inspired Force Majeure? It means force of nature. I want all people to be their own force of nature to drive themselves through this life we’ve been given. I’ve been influenced by Monty Python. They’re now back doing gigs in July of this year. They’re my comedy gods. My stuff is very Monty Python-esque but stand-up, with one person doing all the roles. My life is ongoing research into history. It’s not that I talk about human sacrifice and then I research that. I’m always interested in history. I developed the show in L.A., San Francisco and New York by doing two shows a night. I improvised around my work-in-progress shows. I hit upon the human sacrifice thing because it is a weird thing. Why did we ever decide to kill a human to please a god? God has obviously created the human beings. It doesn’t make any sense. I think it was the birth of fascism. That is my argument. I can make a point, talk about it in a silly way but also have a serious underlying thing. It’s perfect for my humor. So, you were always a history buff? I always liked history at school. I didn’t like doing the essays. Why did World War I start? That would be the big title and then you’d have to write on that topic. I could do them better now. I liked the facts. I’m pretty encyclopedic on major battles of the world and political history. Churchill was a big student of history. If you look closely at repeated behavior, you can read the future and see the bad side of where we would go and the good side of where we could go. We hear so much about a crisis in literacy and a decline in general intelligence. But your comedy caters to a sophisticated audience. Does that contradict the pundits who think people aren’t as smart as they once were? That is an interesting point. I think the audience I’m talking to, which is not mainstream, has been there since the dawn of time. We can get through to them better with the internet. They can see my stuff. It’s self-policing in a way that people who like it can pass it on to other people who would like it. Getting more dumb as we go on? I don’t know. Maybe less bright people are getting access to the airwaves. Maybe on the reality shows — which are like car crash TV — you see people who are not so erudite. They just talk about what clothes they wear and who they wanna shag. Maybe people who are not as erudite get so much airtime that seems like we’re getting flooded by the lowest common denominator stuff. But it’s the golden era of television and there is great stuff going on. Along the way, you performed the show entirely in French and you performed a month-long run of the show entirely in German. Now you plan to perform in Spanish, Russian and Arabic? I did two months in Germany in Berlin and Hamburg and I’m ready to tour in German. I’m 40 percent fluent in that language. The Spanish I just started. I did 15 minutes in Spanish. Then, Russian is after that. And Arabic is after that. I need to do them one at a time. It will be a total of six. Did languages come easy to you? We started French at eight in my school. I did eight years of it, which is equivalent to three months in France. You should just get out to the country and learn the language there. I don’t think I picked them up that fast. I had two years of German. My brother translates the shows and he’s the master linguist and I am the apprentice. What was the craziest question a fan asked during one of your Q&A sessions? Um, not that crazy. They’re good. They go from politics to comedy to makeup. These are the questions I get. We started doing that in 2008 and the exciting process. If one person asks a question and there’s 200 people there, all 200 people hear the answer. It’s like if any of them had asked that question. You recently wrapped filming Boychoir in Connecticut with Dustin Hoffman, Kathy Bates and Debra Winger. Any good anecdotes from the experience? Well, it was great fun. I had to work out what my character was. My character and Dustin’s character hated each other so we kept saying sardonic things to each other. There was one whole adlibbed final scene where Dustin was sitting there and invited me into his office for the first time. It was quite fun to be sparring with the greatness of Hoffman. He took us to a burger bar in Connecticut for lunch and that was great fun. Great atmosphere on the set. Great director. I’m hopeful it will be a good film. It’s like Billy Elliott with voices rather than dancing. .
Talk about your role in the upcoming film Absolutely Anything. I just had a small cameo in that one. I just play a slightly crazy, vicious school head teacher who Simon Pegg’s character can manipulate with his own mind and powers. You’ve done theater, TV, drama and stand-up comedy. Is there anything left on your bucket list? Well, yeah. Bucket list — that sounds like you’re about to die. Running marathons has been great. I’d like to do Ironman. I’ve almost done a half Ironman. Politics is coming in 2020 so that’s on the list. It’s not a random list. These are things I really want to do. I’m not going to go and eat a whole bag of spoons or go to the moon on a balloon. I would like to do a gig in space at the international space station. I could do an English gig and a Russian gig. I thought they all lived together but I guess they don’t, so it’d be nice to make sure everything is happening in a big, international way.